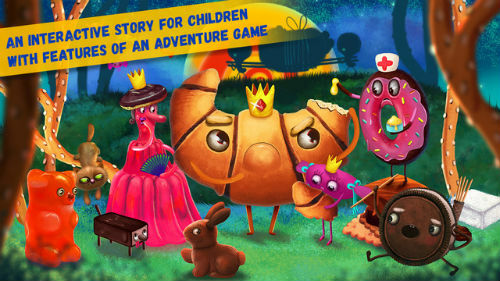 Snot & Fluff may just be the best looking children’s story we have yet seen here at The Smartphone App Review, with simply stunning artwork that will pull your child into a weird and wonderful world, with plenty to interact with and find, all wrapped up in a sweet and funny moral based story. We reviewed the Android version here, but you can also find a version for iOS here: iTunes. The game, which is more of an interactive storybook, follows the adventures of two characters, the eponymous Snot & Fluff, who have wildly differing personalities that are used well by the writers as the adventure progresses. The world they inhabit is a glorious one to behold, with an art style that brings Rayman’s more recent outings to mind. Every scene has had lavish amounts of attention dedicated to it, and kids are just going to love it. Aside from the main story, there is plenty to do here, with every part of the story board available to view at any time, meaning that kids can gain access to their favourite parts whenever they like. There are hidden stars to collect, and even a secret room to find, with many sound effects all through the story. The app is also very easy to use, with an effortless interface meaning that kids and less tech-savvy adults will have no problem breezing through the content. There is a lot to love here, from the gorgeous artwork to the heartwarming story, and the interactive elements are the real icing on the cake. Highly recommended to parents everywhere.